In a letter to the editor submitted to JAMA but not yet published, TMA President Carlos J. Cardenas, MD, agrees on the importance of self-regulation to his profession. "It encompasses our responsibility and our authority to establish and enforce standards of education, training, and practice," Dr. Cardenas wrote. "We routinely defend that responsibility and authority in advocating against the intrusion of all third parties — such as government, private insurers, hospital administrators — into the practice of medicine." 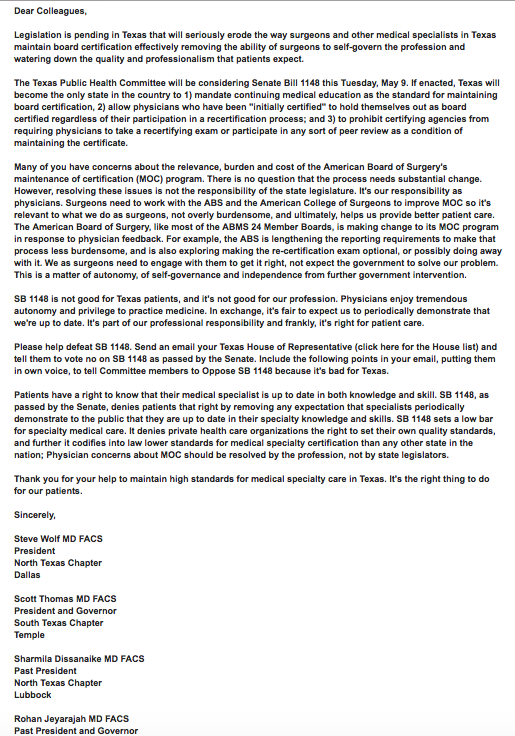 But physicians in Texas and across the country, he argued, do not see the certifying boards as "self." "They are, instead, profit-driven organizations beholden to their own financial interests," Dr. Cardenas wrote. "In fact, they are now one of the outsiders intruding into the practice of medicine." Until the boards "completely overhaul their processes, finances, and lack of transparency," he concluded, physicians "will have no choice but to continue to seek statutory defenses against these third-party intrusions into our noble profession." Here's a link to the full statement. 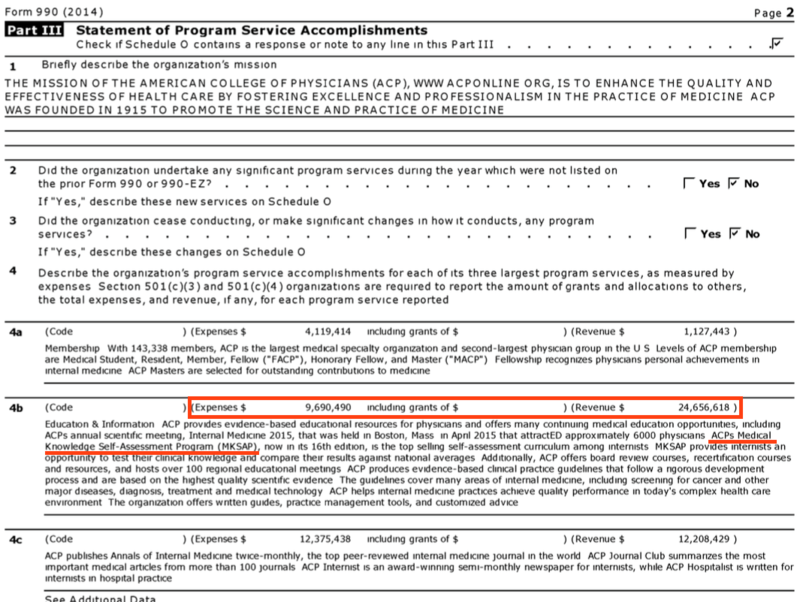 The American Board of Medical Specialties (ABMS) successfully lobbied to have their proprietary Maintenance of Certification® (MOC®) program included in the new Merit-Based Incentive Payment Program of the new Center for Medicare and Medicaid Services (CMS) "quality payment program" within Medicare Access and CHIP Reauthorization Act of 2015 (MACRA) legislation. Hospitals and insurers continue to demand MOC® recertification of their physicians without asking a most important question: has MOC® been harmful to patients or their physicians? 29. Defendant ABMS’s foregoing agreements and actions resulted in the unjustified exclusion of a physician member of Plaintiff AAPS (“J.E.”) from the medical staff at SMC, a hospital located in Somerville, New Jersey. 30. Physician J.E. had been on the SMC medical staff to treat patients there for twenty-nine (29) years. 31. J.E. had been board certified by The American Board of Family Practice, which subsequently changed its name to The American Board of Family Medicine (“ABFM”). 32. In 2011, SMC refused to allow J.E. to remain on its medical staff unless he complied with an extremely burdensome and impractical recertification procedure under the ABMS MOC®. 33. ABFM is one of the 24 corporations identified above that has agreed with Defendant ABMS to implement ABMS MOC®. 35. The foregoing requirements demand far in excess of 100 hours for a typical physician, with the possibility of an unjustified rejection of recertification for reasons having no proven connection with patient care. 36. The foregoing requirements further impose many thousands of dollars in fees and travel expenses. 37. The foregoing requirements take physicians away from providing care for patients. 39. Like many other AAPS physician members, J.E. spends a substantial percentage of his time providing charity care to patients who would not otherwise have access to medical care. 40. J.E. manages and works in a standalone medical charity clinic for a substantial part of each week. 41. Requiring J.E. 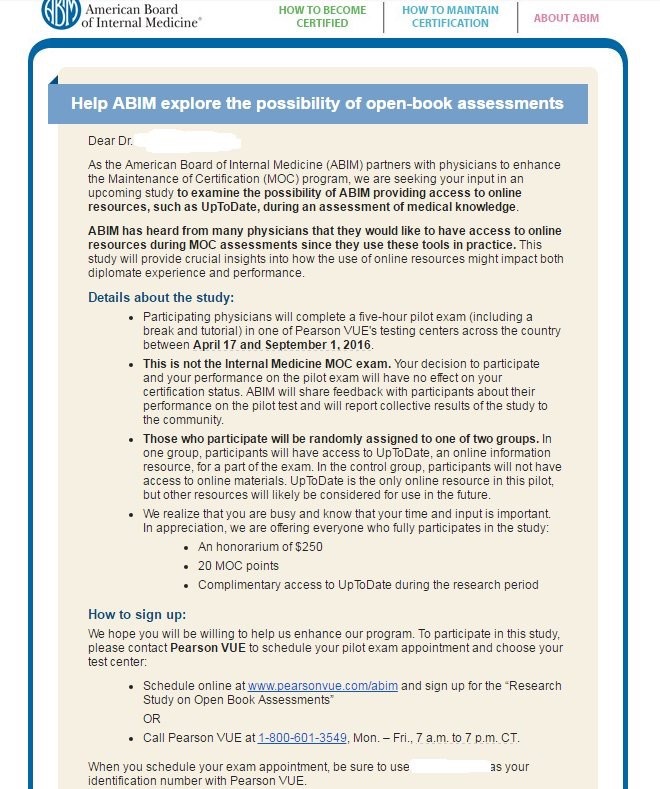 to spend hundreds of hours on requirements for recertification under ABMS MOC® would result in an hour-for-hour reduction in his availability to provide medical care to his many charity patients, who recently surpassed 30,000 patient visits in total number. 42. Patients of J.E. typically lack any alternate means of obtaining comparable medical care. 43. J.E. continued to serve his charity patients rather than comply with the foregoing burdens of recertification demanded by Defendant’s agreement with ABFM to implement ABMS MOC®. 44. Effective June 24, 2011, SMC excluded J.E. from its medical staff, as a result of Defendant ABMS’s agreements with other entities to require the ABMS MOC® program. 45. Patients are now denied the benefit of being evaluated and treated by J.E. when taken by emergency to SMC. 46. There is no value to patients in the completion of the above litany of onerous recertification requirements. 47. 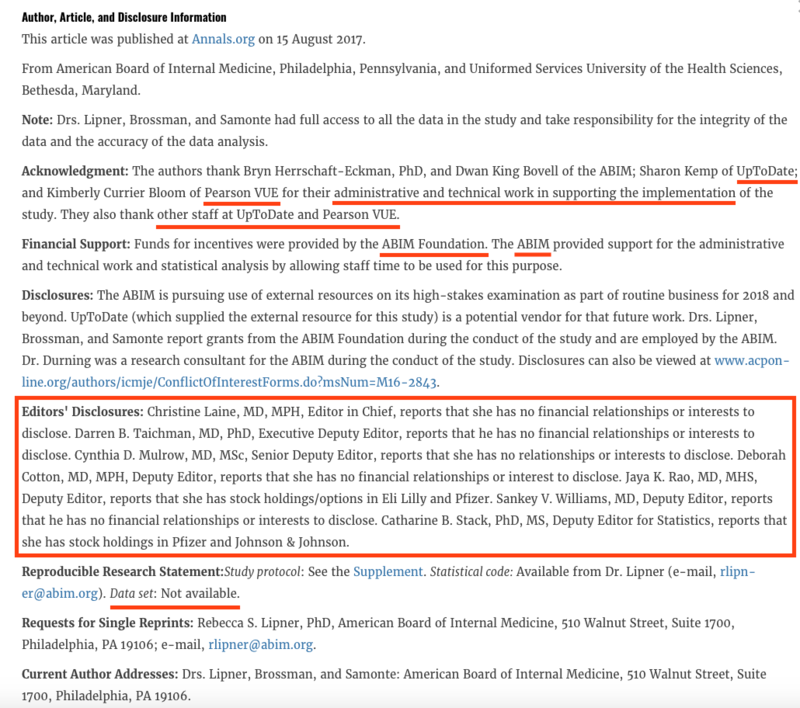 The lack of any genuine value of ABMS MOC® as a measure of professional skill or competence is demonstrated (viewed March 4, 2013) by how ABMS itself selected and appointed as its new President/CEO in 2012 someone who was “Not Meeting MOC Requirements,” but had an exemption not available to younger physicians. 48. J.E. is unquestionably a first-rate physician who continues to practice in good standing in New Jersey. 49. Whether J.E. 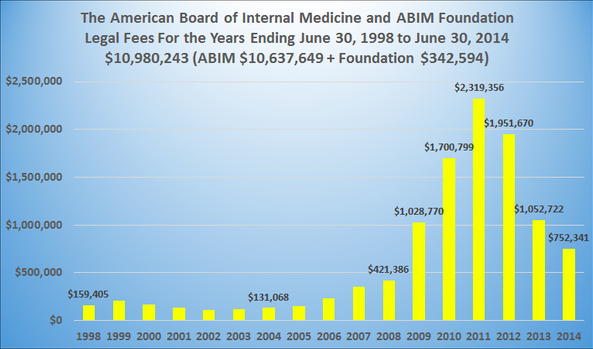 purchases and complies with ABMS MOC®, as implemented by the ABFM, has no bearing on his medical skills as a physician. 50. Like J.E., other members of AAPS face imminent injury from Defendant’s agreements to impose ABMS MOC®, and Defendant’s concerted actions to require physicians to purchase and comply with its proprietary product. 51. Defendant’s agreements and concerted actions limit the supply of physicians available to hospitalized patients, thereby denying patients care by their choice of physicians." "Regarding opting out (from MOC®), I can demonstrate harm to my patients. As you know, I did not pay the $1300 to the ABP. I have no educational requirements due until 2023. 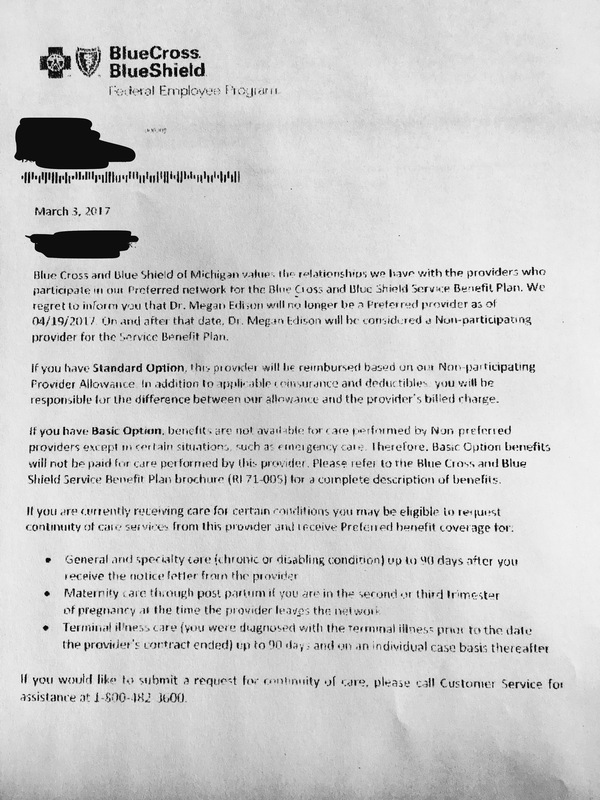 Within weeks of not paying, Blue Cross/Blue Shield of Michigan (BCBSM) sent me a letter dated 19 January 2017 (and received by my office 28 Feb 2017) telling me to pay by 20 March, 2017 or I would be kicked off their panel. I mailed my appeal letter 1 March 2017. 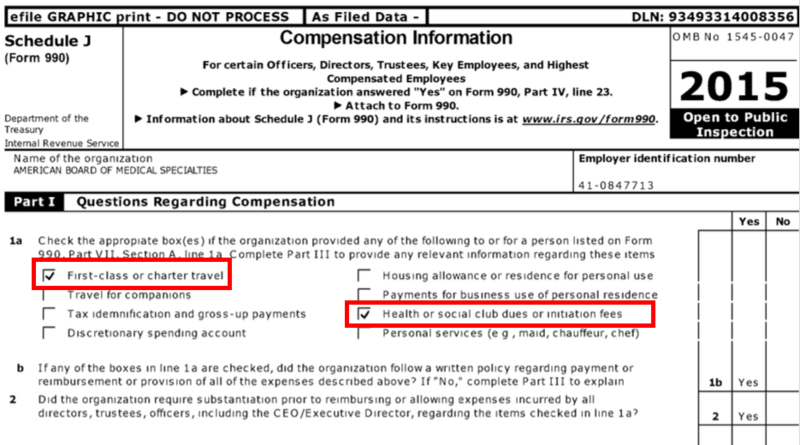 When I did not pay, BCBSM did not contact me to initiate the appeal process detailed in my contract ( which involves two peer-to-peer hearings where I can explain by case). Instead, they sent letters directly to my patients telling them I was no longer a qualified in-network physician and they would be reassigned to another doctor. I was not allowed to see my patients without having another physician in the room with me. Even if my patients decided to pay cash to see me, any prescriptions or studies ordered would not be covered by BCBSM. On March 10, 2017, I received notice that my appeal hearing was granted for 5 April 2017. 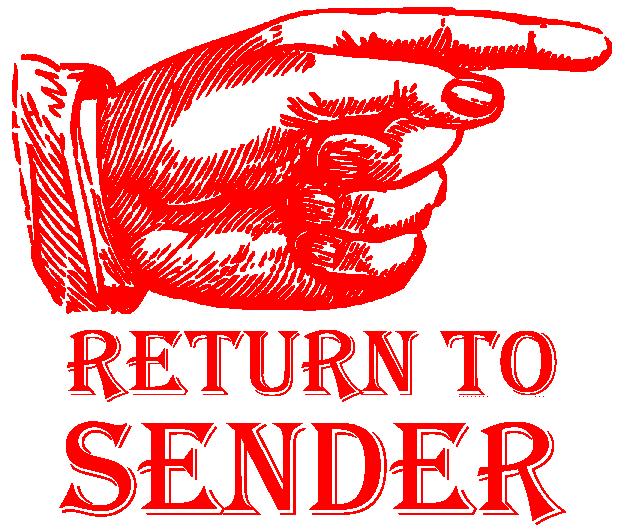 They refused to stop sending the letters pending my active appeal case. They said they would continue sending letters until I complied, or my appeal was done, whichever happened first. Obviously, this caused extreme distress for my patients and my staff. I contacted a lawyer with the Michigan State Medical Society, who told me to pay the money. I did. Within seconds I had my board certificate in hand. Within hours BCBS re-instated me and never sent out another letter. Of course, they never sent letters to the hundreds of patients letting them know of their error. I am not the only one this has happened to, it happens all the time. To opt out of MOC®, docs are hiring NPs to see their BCBS patients because they will credential a NP...but not a MD opting out of MOC®. 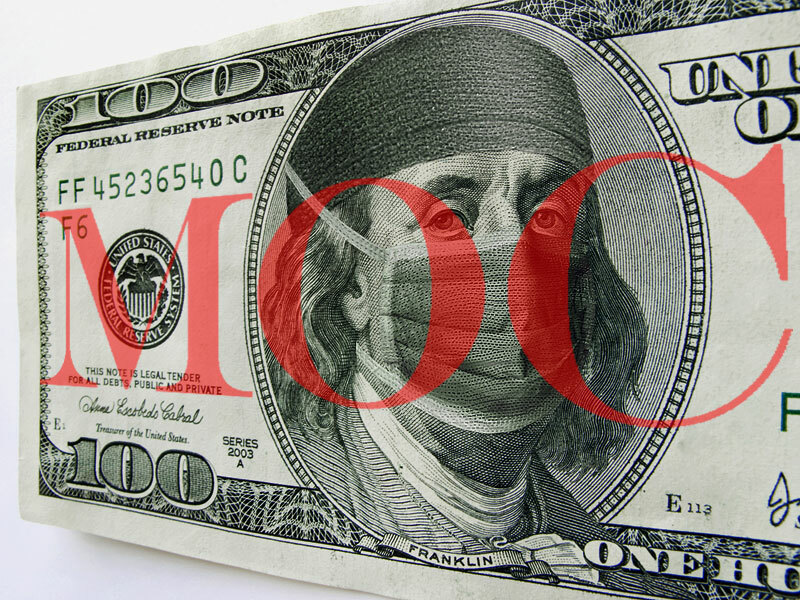 It's madness that MOC® is now more important than a MD." As seen in these examples above, the American Board of Medical Specialties' MOC® program is not a benign recurrent educational exercise for physicians. Rather, MOC® is a means of assuring a continuous cash flow to ABMS member boards using threats and intimidation by unaccountable ABMS member board members and insurers that adversely affects patients as well. In total, the boards reported $701 million (85% CI, $644 million-$758 million) in assets and $65.6 million (95% CI, $60 million - $71 million) in liabilities (difference, $635 million (95% CI, $584 million - $687 million))(Table 2). Six boards reported no debt; and the remaining 18 held reported assets that substantially exceeded liabilities. 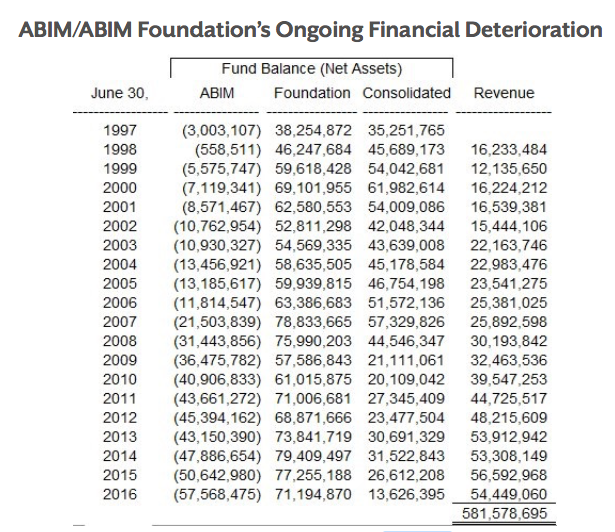 Between 2003 and 2013, the change in net balance (ie, the difference of assets and liabilities) of the ABMS member boards grew from $237 million (85% CI, $232 million-241 million) to $635 million (95% CI, $584 million - $687 million). ... As a result of such margins, the member boards saw a mean annual growth rate of 10.4% during the decade studied. This study is limited by the data source. Although IRS Form 990s includes major funding sources and amounts of revenue, expenses, liabilities, and assets, it does not contain complete and specific financial accounting for the ABMS member boards. 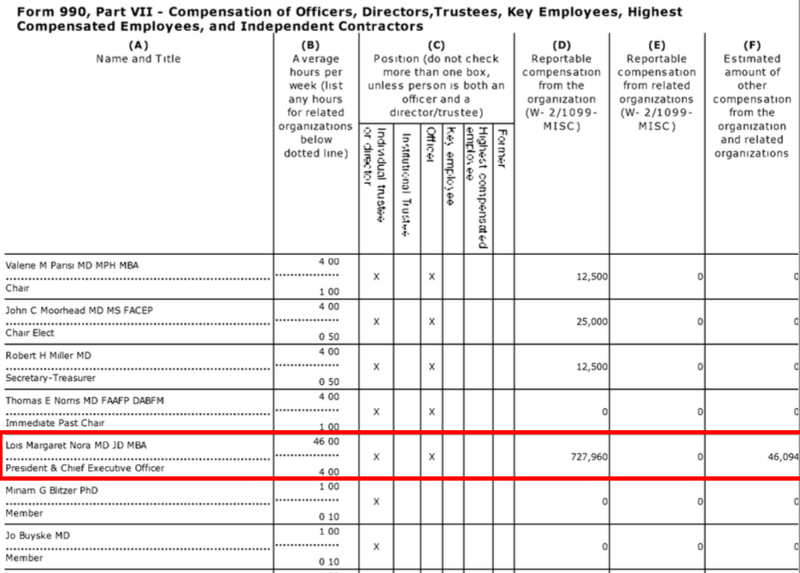 Also, board subsidiaries and foundations were not included. (Emphasis mine). 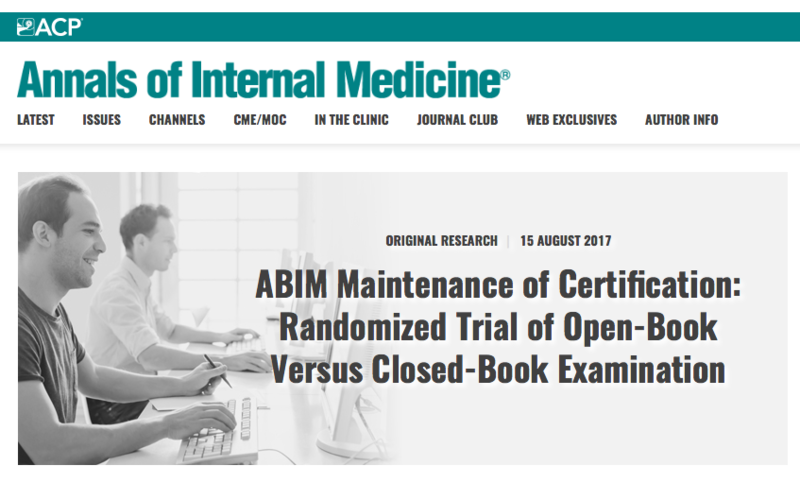 Given these data, justification for Maintenenace of Certification for anything other than financial renumeration for the ABMS member boards and their supporting organizations is impossible to dispute. Their windfall is a direct result of the creation of Maintenance of Certification and their monopolization of the physician credentialing market by regulatory capture. Please consider joining Practicing Physicians of America, Inc. to help end the extortion of practicing US physicians by the ABMS specialty boards and their collaborating organizations at the Accreditation Council of Graduate Medical Education. Reference: Drolet BC and Tandon VJ. Fees for Certification and Finances of the Medical Specialty Boards. JAMA 1 Aug 2017; 218(5): 477-479. Update: (video via MedPageToday) Where Do all Those MOC Fees Go?